Your heating system is critical to the enjoyment of your home. Quality equipment and furnace installation impacts your comfort, safety, health, and budget, year after year. Investing in new, or upgrading an outdated unit, is a big decision, and there’s no margin for error. When you contact Provincial Heating & Cooling Inc, we guide you through every stage of the process, and ensure the end result meets your highest demand. Custom design, accurate sizing, and a complete system tailored to your unique requirements adds up to superior reliability and more consistent temperature control. Meticulous attention to detail and skilled workmanship results in a system that operates safely, at maximum efficiency, and lasts longer. By contacting Provincial Heating & Cooling Inc for heating and Winnipeg furnace installation services, your investment is protected. The only Carrier Factory Authorized Dealer in Manitoba, Provincial Heating & Cooling Inc consistently meets rigid criteria for sound business practices, customer dedication, and ongoing technical training. Our NATE-certified technicians are uniquely qualified to recommend and implement the perfect system for your specific requirements. We offer free estimates, financing options, and bring more than a tape measure to calculate the heating load of your home. Factors, such as value of insulation, windows and doors, style of construction, hot and cold spots, number and age of occupants, future plans, budget, and your expectations, all play a part in your comfort demands. By taking the time to consider every aspect, Provincial Heating & Cooling Inc provides sustainable solutions that will keep you happy in the long run. Do you need gas fittings or a new water heater? You can count on Provincial Heating & Cooling Inc. We are your local and dependable water heater dealer. Our team of expert water heater installers can replace your existing water heater with a high-efficiency model. Our technicians are proficient in everything from gas fittings to heating installation, such as water heaters or furnaces. One call does it all! Call Provincial Heating & Cooling Inc at (204) 339-4328 to warm up your home! Proudly serving Winnipeg and surrounding areas. For accurate furnace installations performed by a professional, contact Provincial Heating & Cooling Inc! 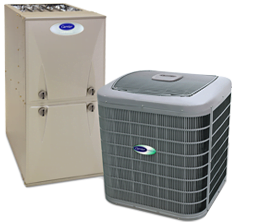 We specialize in Carrier brand heating systems, offering our customers the worldwide leader in innovation and technology. Carrier continues to push the envelope, and the result is unprecedented energy savings, conveniences, and comfort. Whether you’re looking for budget-friendly options, limited by tight installation space, or hoping to take advantage of state-of-the-art features, such as zoning, WiFi compatibility, and adaptable-speed, Provincial Heating & Cooling Inc has the perfect solution. Models in the Comfort, Performance, and Infinity Series rise to any challenge, satisfy every item on your wish list, and defend against any weather extreme. Contact Provincial Heating & Cooling Inc for all the information you need to make smart choices, and rest assured, your project will be completed accurately, promptly, and to your total satisfaction.